What are the existing vehicle leak detection methods and what are their strengths and weaknesses? Employs an ultraviolet or UV/blue light inspection lamp and fluorescent dyes to find even the smallest leaks quickly and easily. It locates multiple leaks and those not found by any other method. Its lack of disadvantages explains why it is the most popular leak detection technique. In addition to diagnostics, it is the only preventive/programmed maintenance method that detects all refrigerant and fluid leaks. This labor-intensive procedure is very time-consuming except for the largest, most obvious leaks. Some people lay newspaper down to try to locate the general area of the leak. They will check the color of the fluid to try to identify what system it is coming from, i.e., red for transmission fluid, green for coolant, etc. However, it’s often difficult to pinpoint the exact source. Cannot be used for refrigerant leaks or for small leaks which evaporate right away. It’s difficult to detect clear liquids. Although it’s inexpensive, this method has a number of serious drawbacks. In addition to being very time-consuming, it is not applicable to oil, hydraulics, transmissions and fuel. Only for refrigerant leaks. Spraying foot powder on and around a suspect area may help you to find the leak if you’re lucky. But don’t run the engine, or you’ll make a real mess. This powder can also foul up carburetors. Only for oil leaks. Detects only the general area of a refrigerant leak, not the exact location.This fragile device does not withstand hard use. In addition, it does not operate well in humid conditions. Only for refrigerant leaks. Used in water-cooling systems, it can damage hoses, radiators, and other components. It can actually cause additional leaks and enlarge existing ones. Only for coolant leaks. What method is the fastest, most accurate, safest and easiest to use? Tracerline fluorescent leak detection. It uses ultraviolet or UV/blue light inspection lamps and fluorescent dyes to easily pinpoint even hard-to-find leaks in minutes and engine cleaning is not required. What kind of leaks can fluorescent leak detection find? Tracerline fluorescent leak detection locates all leaks in any circulatory system: refrigerant, oil, coolant, fuel, ATF, power steering and hydraulics, as well as auto body water leaks. NOT for brake systems. What types of fluorescent dyes should be used? Use patented Fluoro-Lite® dyes in air conditioning and refrigeration systems. Fluoro-Lite works with all refrigerants (including R-134a) and is available in different concentrations to accommodate systems of all sizes. It can be used with refrigerant recharging or recycling equipment. Fluoro-Lite is available in one-ounce bottles (used with a refillable dye injector) or in the revolutionary Tracer-Stick® capsules, which are prefilled with premeasured doses of Fluoro-Lite to make leak detection even easier, faster and neater. The unique EZ-Ject™ multi-dose dye injector (patented) offers a third way to introduce Fluoro-Lite dye into an air conditioning or refrigeration system. Each EZ-Ject dye cartridge treats seven or more standard-sized vehicles. Our advanced-formula full-spectrum Dye-Lite® TP-3400 All-In-One™ dye (US Patent 6,165,384) features the unique combination of two different fluorescent dyes. One is designed to fluoresce best under UV and the other under blue light. So, no matter what type of inspection lamp you use, our All-In-One dye will glow brightly! It is ideal for use in all oil and oil-based fluid systems, including gasoline engine oil, diesel engine oil, gasoline, diesel fuel, automatic transmission fluid, power steering fluid, hydraulic and lubrication fluids. A single one-ounce bottle can often be used for two or more applications, offering dramatic cost savings! All-In-One dye is available in packages of six or 24 one-ounce bottles as well as in 16-ounce and 32-ounce bottles. Use Dye-Lite TP-3090 to find oil leaks in gasoline engines. Use Dye-Lite TP-3100 to find oil leaks in diesel engines. Use Dye-Lite TP-3200 to find leaks in ATF and power steering systems. Use Dye-Lite TP-3700 to find gasoline and diesel fuel leaks in fuel systems, gas lines, fuel injector lines, etc. Use Dye-Lite TP-3900 to find water/coolant leaks in radiators, water hoses, heaters, water pumps, freeze plugs, gaskets, etc. Is Tracer Products leak detection hard to use? No. It uses a simple 2-step procedure that makes it easy to locate even hard-to-find leaks in just minutes. Step 2 Inspect the system with a Tracerline ultraviolet or UV/blue light inspection lamp and all leaks will glow brightly! Are the dyes harmful to the system in any way? No. Dye-Lite and Fluoro-Lite dyes are completely safe when added to the system as directed. Do I need to flush the system afterwards? No. Dye-Lite and Fluoro-Lite dyes never need to be removed. In fact, they are designed to stay in the system so you can easily recheck the repair and find future leaks. Do I need to use additional dye to check that the repaired system no longer leaks? Step 1 Clean the repaired area with GLO-AWAY™ dye cleaner or a general-purpose shop cleaner. Step 2 Run the system. Step 3 Reinspect the area with the ultraviolet lamp. No glow means you’ve repaired all the leaks. How do I get started in fluorescent leak detection? Tracer Products offers a wide range of leak detection kits, lamps, dyes and accessories to meet your specific needs. Just a car, truck or other vehicle to work on! You only need to reorder the dyes you use. Is this method safe for workers? Absolutely! Just follow the operating instructions provided. Does using this method void new car warranties? No. 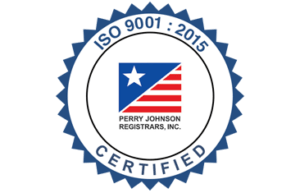 In fact, Tracerline leak detection is used by major U.S. and foreign car manufacturers in their quality control programs. Dye-Lite and Fluoro-Lite dyes are approved by Ford, General Motors, Chrysler, Nissan, Volkswagen, Volvo, Opel, Jaguar, Hyundai, and other major vehicle manufacturers. Can leak detection increase my service orders and profits? Yes! Finding leaks (especially those that were not located by other shops) builds customer satisfaction, enhances your credibility, reduces labor costs, and helps avoid no-charge reworks. Being able to actually show your customers their leaks makes it easy to get the repair order. Plus, Fluoro-Lite conserves expensive refrigerant and helps protect the environment by reducing chlorofluorocarbon (CFC) emissions. How long does it take for the Tracer Products leak detection kit to pay for itself? It’s usually very fast! In fact, many servicemen report that they recovered the cost of the kit on their very first leak repair. How is Tracerline® leak detection superior to competitors’ products? Higher intensity Tracerline inspection lamps give you more power for your money, greater ease of use, and better value. Tracerline lamps are built tougher to withstand hard, round-the-clock use. Tracer Products manufactures and services their own products. Tracer Products has the widest selection of fluorescent dyes to find the broadest range of leaks. Tracer Products provides the best technical support. 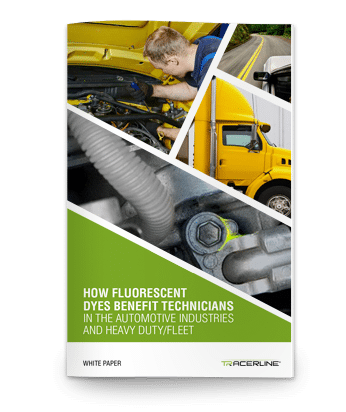 Dye-Lite and Fluoro-Lite dyes have been extensively tested and are used and approved by major vehicle manufacturers worldwide. Dye-Lite and Fluoro-Lite dyes are proven in over 275 million vehicles. How are service centers using Tracer Products leak detection products and tools to increase their business? Since this method enables the vehicle owner to easily see the exact location of every leak, it’s easy to get the repair order. In addition, some repair shops offer this service routinely at a nominal charge for preventive maintenance. They ask their customers if they would like a low-cost leak inspection along with fluid fills, winterization, A/C and transmission tuneups, etc. Selling the leak detection service makes extra money for the station. And finding and fixing more leaks increases business dramatically! For full details, request a free copy of our guide entitled “How to Turn Auto Leaks into Super Profits”.